America consumes, wastes, and pollutes more per person than any other country on the face of the Earth. America is also is the only country left on the face of the Earth……… that is still “debating” the scientific evidence for man-made global warming. The “miracle of plastic“…has come with a steep price. And now we are all starting to pay it. Plastic is “forever” – it will slowly degrade out in the natural world, but only to a single molecular level.Then its done degrading. Forever. Plastic never really “goes away”. It’s in the BELLY OF THE WHALE. Throughout the history of our species, we have always looked to technology to make us more comfortable and to improve our lives. And most times, it has done that. You might even say our species is “obsessed” with technology. particularly when it has comes to using it to modify the natural environment. Manipulating the natural world through the application of technology in certain areas of the world, has almost always created short term gains at the expense of worse problems down the road. Now the manipulation is “going global”. Certain global elite have decided, on our behalf, that the human species should inject reflective particles into the atmosphere around the world, in an attempt to slow down global warming. 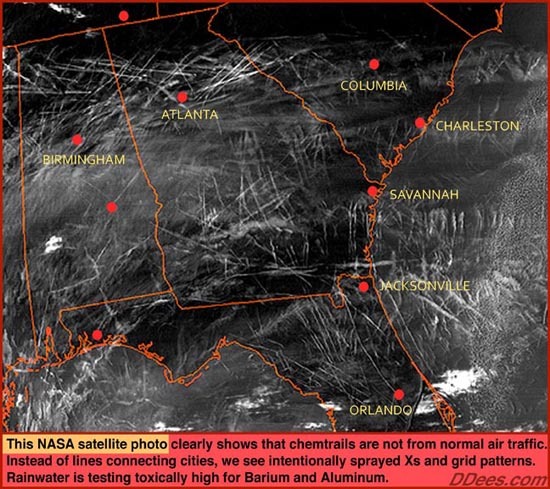 This desperate technological fix, called “chem-trails”, not only “kicks” the immense sustainability problems we now face as a species “down the road”, but it does nothing to stop the carbon emission problem at its sources, and is wrought with possible negative side effects we haven’t even begun to understand. Until we learn to live not only without our own means “economically”, but within the means of Nature….we will continue to suffer the tragedy of unintended consequences. Because in the end, Nature always wins. We live in “exponential” times. Times of “exponential technological development”. Yet the minds, bodies, and souls we possess are still in a relative primal state, having evolved over the millenia at a fraction of the pace of life we are witnessing today. We were told this technology would “liberate us” – yet Americans are working harder and longer hours every year. “Adrenal gland burnout” is at an all-time high – and escalating. Because instead of running from a wild beast every once in a while, we are now being dragged by an “electronic beast” 24/7. As a society in the past, America built skyscapers, won two world wars, and put a man on the moon….all without cell phones. Are our lives really better overall – now that we cannnot live without our cell phones? We now seem to be “multi-tasking” multi-tasking. If it seems that everyone these days has a sort of “culturally induced ADD” – it’s not your imagination. “Time compression” is the now number one threat to the average American’s well-being. Most Americans are totally oblivious to this relatively recent phenomena. Time compression degrades our physical, mental, emotional, and spiritual health in all ways, as well as our relationships in all ways. There is no aspect of our life it does not ravage. It is the invisible menace of the “Information Age”. It steals the most precious resource we have. I am going to turn “the beast” off now….walk outside….and inhale slowly and deeply.